Jorge Manuel d’Abreu Palma, known as Jorge Palma (born June 4, 1950 in Lisbon, Portugal), is a Portuguese singer and songwriter. At the age of six, Palma learnt to play the piano and to read. When he was eight years old he performed his first piano audition in the Portuguese National Conservatory. In 1963, aged 13, Palma finished second in a musical contest in Majorca, Spain. At the same time, he continued his studies, first at the Camões high school and next at a school in Abrantes. The next year, 1964, marked a turning point in Palma's musical style, after leaving his classical influences he started to play rock'n'roll and taught himself to play guitar. In 1969, he joined the Hard rock band Sindikato while continuing his studies in the Faculty of Sciences at the University of Lisbon. Being in the band gave him the opportunity to play in the very first edition of the Vilar de Mouros Festival, in 1971. In that same year, aided by some friends, such as Rão Kyao, João Maló, Rui Cardoso and Vítor Mamede, he began to write lyrics and compose songs and in the end he recorded, with Sindikato, an album with a single and an album of covers. In order to avoid conscription and the Portuguese Colonial War in Portugal's overseas territories in Africa, Jorge Palma dropped out of university and went to Denmark with his wife, Gisela Brande, where he lived from 1973 to 1974 as a political refugee. In Denmark, he got a job at a hotel and presented some of his musical works through radio broadcast. After the Carnation Revolution on 25 April 1974 in Lisbon, Jorge Palma returned home. 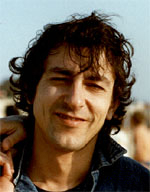 Jorge Palma's solo career started with the release of the single "The Nine Billion Names of God", based on the short story of the same name by Arthur C. Clarke with lyrics in English language. After that he spent some time improving his writing skills in Portuguese language with the famous poet and song lyricist José Carlos Ary dos Santos. His first LP, named Com Uma Viagem na Palma da Mão was released in 1975, in a style very influenced by Progressive Rock acts such as Yes, Genesis and Gentle Giant. In 1977, he released his second album, Té Já, album that made him play abroad, in Spain and Brazil. Palma spent the following years, 1978 and 1979, in France, mainly in Paris, where he performed in several bars, playing songs of some major names of the musical panorama, such as Bob Dylan, Leonard Cohen, Paul Simon, Crosby, Stills & Nash and others. After returning to Portugal, in 1979, Palma recorded and released his 3rd album, named Qualquer Coisa Pá Música, followed by live concerts alone or with the group O Bando. In the early 1980s, he travelled to Paris, only returning in 1982 in order to finish the record of his 4th album, Acto Contínuo, album that was first meant to be a live album, but due to some difficulties, was recorded in studio. In 1983, when Palma was about to restart his musical studies, which he would finish in 1986, his first son, Vicente Palma, was born. In the next year, Palma recorded his 5th album, Asas e Penas, where he included a song dedicated to Vicente, named Castor (Beaver). In that same year he performed in Portugal, France and Italy, sometimes playing in the streets. In 1985, Palma released one of the most acclaimed albums of his career, named O Lado Errado da Noite, the album included the single Deixa-me Rir, which became a huge success. The album received several musical awards and many music critics called it "the right side of Jorge Palma" (the album name is translated from Portuguese as "the wrong side of the night"). After releasing the album, Palma made a major Tournee, Azores and Madeira. In 1986 Palma finished his piano course and recorded the seventh album, Quarto Minguante, which was marked by the recording company's will of changing Palma's musical style, a thing he refused. After releasing his eighth album, Bairro do Amor, in 1989, Palma started a long period without releasing an album of originals, but continued his piano studies, finishing the Superior Course of Piano in the Portuguese National Conservatory in the next year. This last album was considered by many critics and newspapers among the best Portuguese albums of the century. The album was recorded by PolyGram, unlike the previous, as Palma had finished his contract with EMI after the refusal of the last in releasing the album. In 1991 was released a compilation titled Só, which revisited old songs with only vocals and Piano. After the release of this album, Palma formed the Palma's Gang, with members of the bands Xutos & Pontapés and Rádio Macau, which released a live album in 1993, titled Palma's Gang - Ao Vivo no Johnny Guitar. In that same year, Palma participated in an album of the punk band Censurados. The next two years, Palma performed in several stages from north to south Portugal, alone or with Palma's Gang, some of them broadcast by the RTP - Rádio e Televisão de Portugal. Meanwhile, his second son, Francisco Palma, was born. In 1996, Palma accepted an invitation to join a new project, named Rio Grande, a band that included other famous Portuguese musicians, Tim (Xutos & Pontapés), João Gil (Ala dos Namorados), Rui Veloso and Vitorino. In 1998, Palma played several major concerts, for university students in Lisbon and Porto, and also in the World's Fair Expo '98 in Lisbon. ^ (in Portuguese) Jorge Palma. In Infopédia. Porto: Porto Editora, 2003-2009. URL: http://www.infopedia.pt/$jorge-palma. This page was last edited on 4 February 2019, at 04:36 (UTC).